Laura is another lovely blogger that lives in Japan with her husband! She is a very sweet and creative gal that I have loved getting to know through her blog. I love this post she came up with! Hello! I'm Laura and I blog over at Inspiration.Sparks, where I share all about the wonderful expat life in the little island of Okinawa, Japan. A little over a year ago, my husband who's a Marine got orders here and ever since the day we flew in, we have fallen in love with this place. Over at Inspiration.Sparks you'll find tons of adventure posts, bits of life with my lovely husband, as well as some inspiration here and there, you know, to spice things up. Since Jess will be adventuring it up in Japan, i thought it would be appropriate to share a little bit about my first vacation trip abroad! We moved to Okinawa, Japan in 2012 and although it was technically my first experience traveling abroad, it's a little different because we live here. Okinawa is where we call home, not where we vacation. Last December we flew to mainland Japan and we explored Tokyo, Kyoto and Osaka; I consider this my first vacation trip abroad. Although i want to travel through Asia, i have to confess that its a little intimidating, so mainland Japan seemed like the perfect place to start. We visited so many fun places during our trip, here are my top 5: 5. Ghibli Museum, Mitaka - Husband and I are big Studio Ghibli fans and when we found out there was a museum in Tokyo we knew we had to visit it. We purchased the tickets at one of our friendly neighborhood Lawson convenient stores after a couple of guessed tries at the japanese ticket machine and an extremely nice japanese worker :) It was such a fun, interactive museum even if everything was in japanese, learning how Hayao Miyazaki makes his movies was such a treat. 4. Umeda Sky Building, Osaka - With it's unique architecture, it's 360 degree observatory of Downtown Osaka, the love lock fence and the authentic German christmas market that welcomed us as we entered the building, it's safe to say this was one of our favorite places! 3. The Golden Pavilion, Kyoto - Our last stop in Kyoto was this Zen Buddhist Temple called named, Kinkaku-ji (金閣寺) which literally means "Temple of the Golden Pavilion". It's designated by UNESCO as one of the "Historic Monuments of Ancient Kyoto". 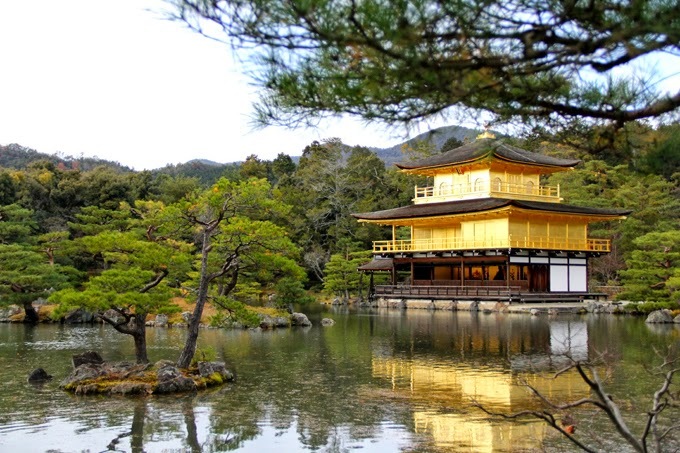 I assure you this picture does not do this temple justice, the top two stories of the pavilion are covered in pure gold leaf and man does it shine, even from across the lake. 2. Sensoji Temple, Tokyo - The first temple we visited was oldest and most popular buddhist temple in Japan. We were greeted by the Kaminarimon ("Thunder Gate"), followed by a huge shopping street, which lead us to this gorgeous temple. It was such a wonderful experience to watch others practice their faith and for us to take it all in. 1. Fushimi Inari Shrine, Kyoto - Dreamy huh?! This was my #1 must see attraction in mainland Japan. This Shinto Shrine was put in place on a mountain top in order to worship Inari, the God of Rice. 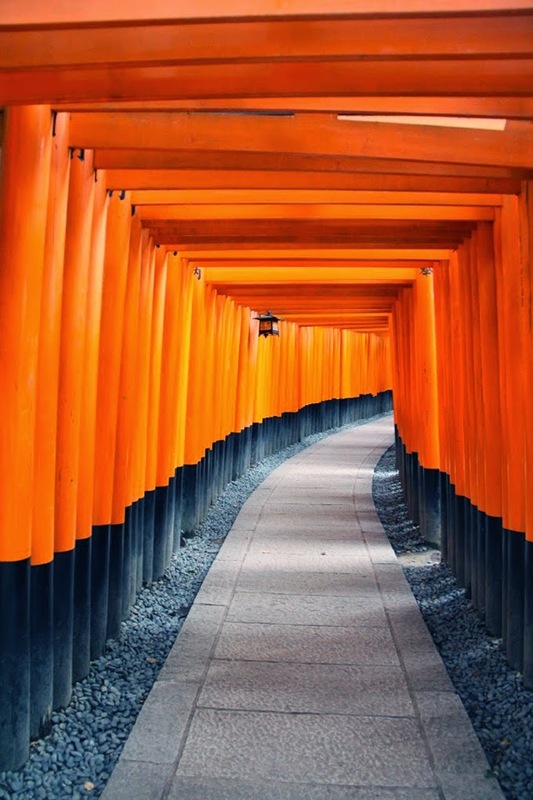 The orange torii gates are traditional japanese gates, all of which were donated by those who have been successful in business; as a way to show gratitude. The shrine is full of these orange torii gates, from tiny ones you can buy for ¥800, to the medium ones (shown above) and gigantic ones as you climb the mountain. It was surreal to walk under tunnels and tunnels of torii's. Q: Have you ever visited Japan? If so, which places are in your top 5? If not, which japanese spots are in your bucket list? Thanks so much Jess for letting me share a peek into my first adventure abroad! If you'd like to read more about the places we visited in mainland Japan, click here!